Well, Fidalgo Island isn’t going to be a tropical paradise for another hundred years and not ever if we have anything to say about Global Warming. But hey, that’s ok with us. 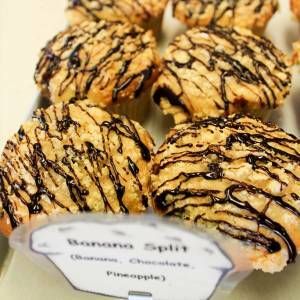 Frank Michaud, a huge proponent of the Green Movement has taken the liberty of providing compensation for tropics to come with his Banana Split muffin. What’s more tropical than Banana and Pineapple under a waterfall of chocolate? Palm trees, but their not that edible.